The transit of a planet is similar to a solar eclipse: A planet passes between us and the sun, with its shadow visible across the sun. However, because the planets are so far away, they appear as a dot against the sun rather than blocking most of the sun as a solar eclipse would. 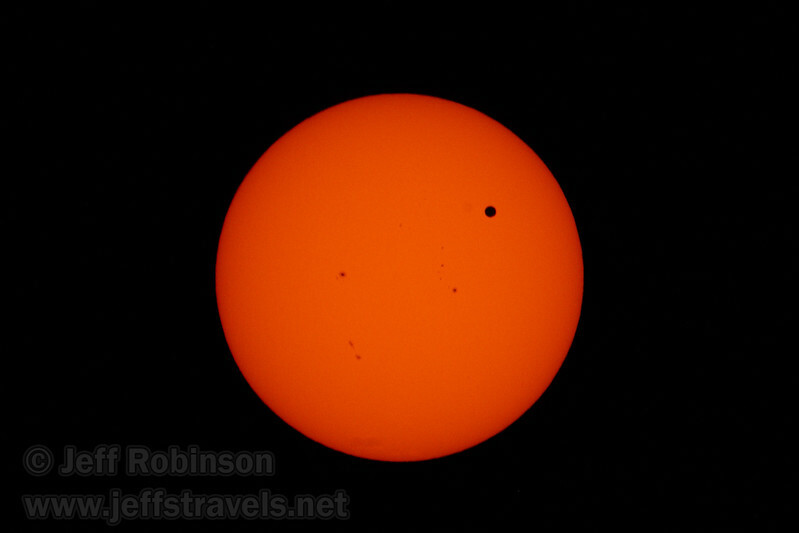 While arguably not as visually exciting as an eclipse, the transit of Venus is a rare event. The one shown here occurred on June 5, 2012. The next one won't occur until December of 2117 (so if you're reading this, you likely won't be alive by the time that happens). I photographed this from Folsom, CA. I was able to capture the start. As sundown approached some clouds moved in and blocked most of the view of the sun, and the transit completed after sundown.